I'd like to know why. I'd also like to expand on the comparisons between the companies further, largely because I see them as the top two contenders for investors wishing to add an allocation to the tech sector with a conservative, dividend-paying blue-chip. To gain more insight into the opposing ROE trends of both companies, I've pulled numbers from their annual reports to construct a five stage Dupont analysis. Note: I'm using annual figures to make the comparisons easier, but these numbers are a little outdated. Apple's fiscal 2014 ended in September 2014, Microsoft's ended in June 2014. This is why I used ttm to examine more current ROE trends on a rolling basis in the beginning of the article. These numbers are still useful for examining the overall trends in ROE for both companies, however. Microsoft won't report FY2015 until the end of July if history is any indication. 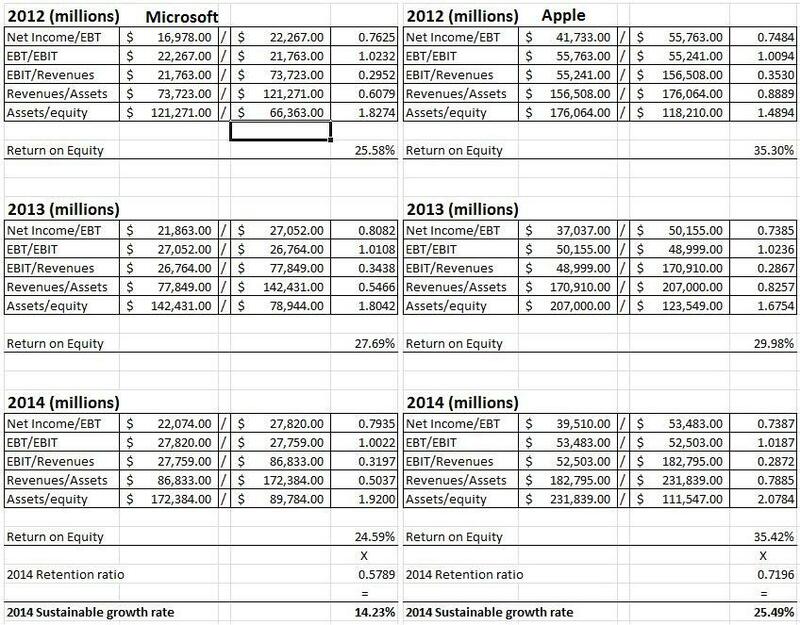 We can see over the last 3 years that Apple has managed to generate better ROE mostly because of its ability to utilize its assets better than Microsoft, despite the latter's better operating margins. Its superior ROE, along with its intention to keep more of its earnings than it pays out in dividends, also gives Apple a superior sustainable growth rate, nearly twice the rate as Microsoft's. 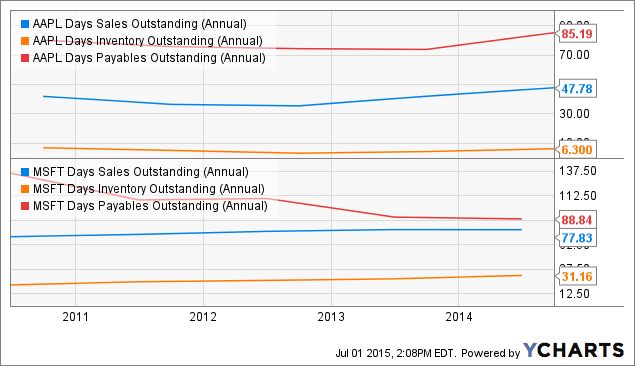 Microsoft's margins are impressive, but declined year-over-year. It should also be noted that it's more dividend-oriented, with shares yielding about 2.8%, as opposed to Apple's dividend yield of only 1.6%. This makes sense, however, because lower growth usually means higher dividends. Apple is expected to grow over 26%, Microsoft is only expected to grow 7-8% for the year. Growth is expected to dip for both firms in 2016, more so for Microsoft than for Apple, however. 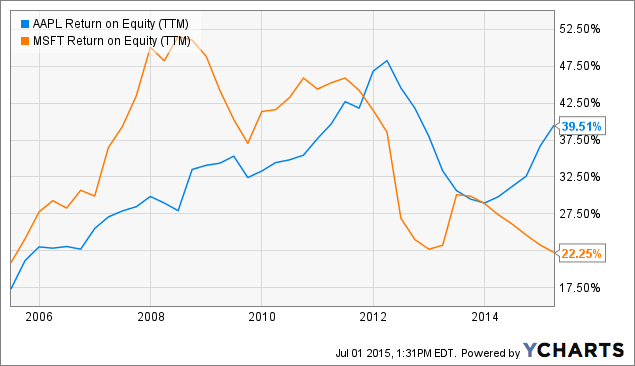 While this makes Apple look more attractive, valuations are important as well. Here's where Apple shines even more, trading at only about 14 times this years earnings and 13 times forward earnings. Microsoft is trading at over 18 times this years earnings and 16 times forward earnings. Turning to the balance sheet, both companies have fat cash piles, with much of it held overseas. This has led to increased debt issuance to cover certain things domestically instead of repatriating the cash to do it, including buybacks. This may help to explain why both companies have seen their financial leverage ratios (assets/equity) trend higher over the last few years. 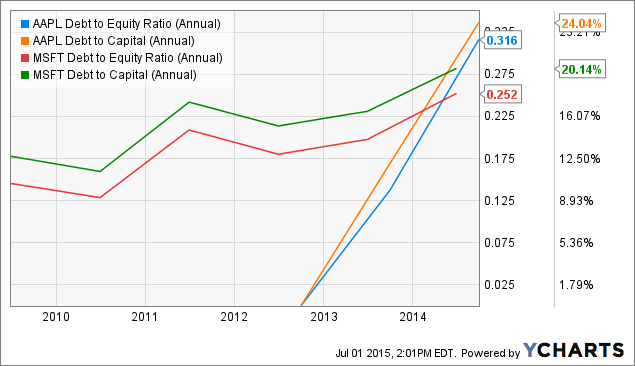 Microsoft carried a current ratio of 2.5 for FY2014, a drop from 2013's ratio of 2.7, but solid nonetheless. Apple's dropped to 1.08 from a current ratio of 1.68 in 2013. This was largely due to an increase in accounts payable and the addition of a significant amount of commercial paper. Both companies appear to have solid liquidity with adequate working capital. I'd now like to turn to the cash conversion cycle to see how efficient the companies are managing cash flow. As can be seen, Microsoft puts more pressure on suppliers by taking longer to pay than Apple does, judging by its DPO. This surprised me, as I thought Apple would be the winner here. Apple's inventory management is incredible as well, and it also seems to convert receivables much more efficiently than Microsoft. We can see that despite the recent trend of both companies issuing more debt, it hasn't battered the overall financial health of either firm by adding too much of it to their existing capital structures. 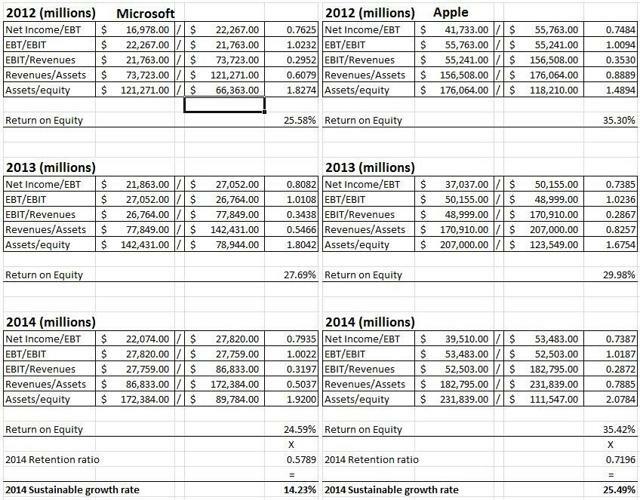 Apple appears to be a more attractive investment than Microsoft when looking at ROE, growth prospects, efficiency, and even balance sheets, so why the discount? In my opinion, it obviously has something to do with the diversification of revenues bases. While Apple has lots of "irons in the fire", it's still heavily reliant on iPhone sales. I think this concern is overblown personally, but I can see the logic of it: one bad iPhone flop and revenues could drop off pretty significantly pretty quickly. Even with this in mind, however, I still think Apple is cheaper than it should be, especially as it seems to be firing on all cylinders. Here's where Microsoft deserves some credit as a long-term investment, however. As long as consumers, and more importantly, businesses, continue to rely on its products like Office, Azure, and Windows, I think the company has a tremendous moat around its business that will remain for many years to come. Especially as it transitions many of these services to be more cloud-oriented, converting them to lucrative subscription-based business models. This cuts down on piracy, and the recurring nature of them makes them even stickier to business in my opinion. Will this degrade margins though? Possibly, which is something to watch out for. I think Apple is a better value here, especially in the near term. Microsoft is still a great longer-term investment, and Apple will likely be as well, depending on what the future of the iPhone and the future diversification of its business mix looks like. Me personally? I'm going to keep collecting dividends from Microsoft, but I'm also seriously considering adding Apple to my portfolio, too. It just looks too cheap not to. Disclosure: I am/we are long MSFT.